The jungle is full of secrets and enthralling stories. Many things in the Biosphere Potsdam cannot be discovered at first glance, therefore we offer guided tours about different topics on every weekend. Subsequently are the dates for our upcoming guided tours. If you arrive with more than ten people, you can book your preferred date, e.g. group tour incl. catering. Please note that we only offer the guided tour "Exotic Flora and Fauna" in English! It is possible to bring your own translator for the other guided tours. Please sign up in advance for a guided tour. We want you to enjoy your guided tour and therefore the group size is limited. If you're interested in participating, please check our German website for the current dates of our guided tours. The team of the Biosphere invites you every noon to participate in the koi feeding with the guidance of our Koi experts. Meeting point: At the jungle pond next to "Café Tropencamp". 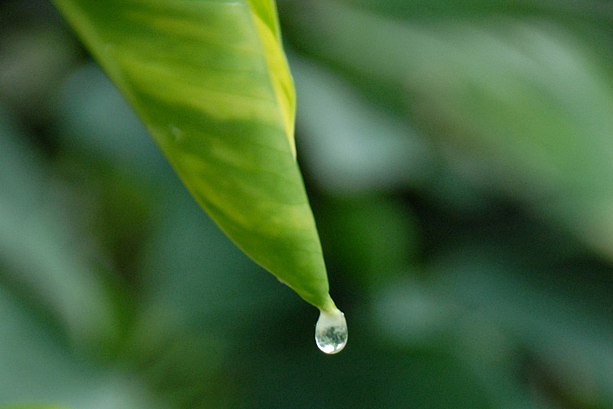 Water is the elixir of life for this world, but it’s not available in the same quantities everywhere. 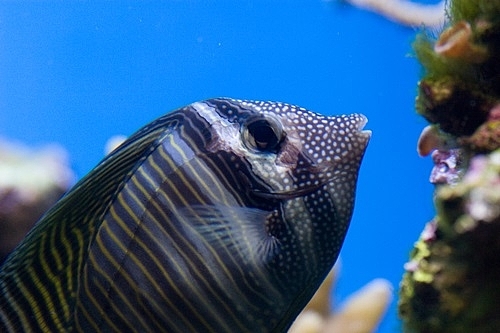 Animals and plants in the desert need to adapt to their arid environment, whereas there is water in abundance in coastal areas and, of course, in the sea itself. Salt and fresh water, or water under the enormous pressure of the deep sea – not all water is the same. Therefore the habitats in lakes, rivers, mangroves and the sea are populated by a diversity of animals and plants. During this tour you will get to know the animals of the desert, but also learn a lot about the diverse relations between animals, plants and humans in the sea. You will discover the importance of oceans for the climate of the earth. This guided tour is suitable for children 10 years and older. Somewhere in-between the corals, inside an anemone, the little clownfish is hiding. In this guided tour designated for children, we explore coral reefs, but also the deep sea. Which fish are swimming in the sea? Where does the blue tang live, where the lsymata and where the frog-fish? What do they actually do the entire day? 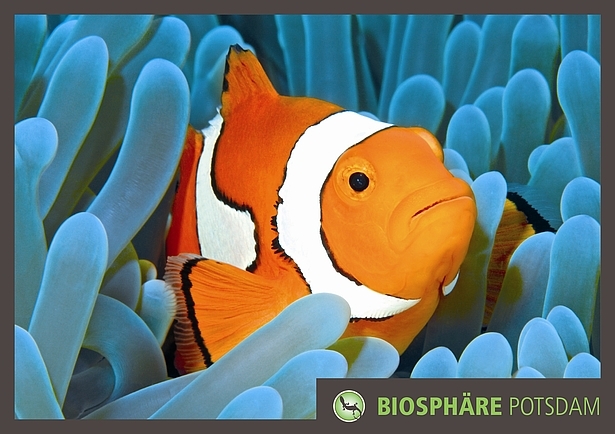 This knowledge will help children to find the clownfish. In the end there will be a little surprise for all explorers. The program is recommended for children between ages 4-10. 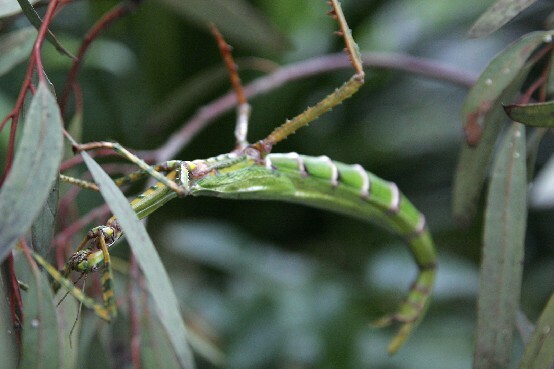 Guided Tour: "Exotic Flora and Fauna"
About 20’000 tropical plants and many exotical animals live in the biosphere. Numerous primeval forest trees, lizards and exotic animals seem strange and familiar at the same time. 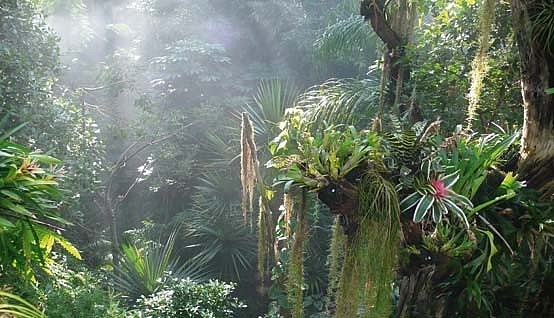 Ever since Alexander von Humboldt and Robinson Crusoe everyone has a certain idea of the tropical rain forest. During the fascinating tour through the flora and fauna of the biosphere, this idea comes to life. Experts of the biosphere tell a lot of interesting, surprising and odd things about the species-rich flora and fauna of the tropical hall. Guided Tour: "Journey through the world of the tropical spices"
One out of ten fruits we eat come from the tropical rainforest or are grown in the tropes. Active agents of plants from tropes are nowadays to be found in every fourth drug. About 30’000 types of plants are suitable for consumption, 7’000 types of plants have been grown as food. Our life would hardly be imaginable without these products. Aside from many food products, especially spices like cinnamon, pepper, nutmeg, ginger and curry improve the taste of our food. 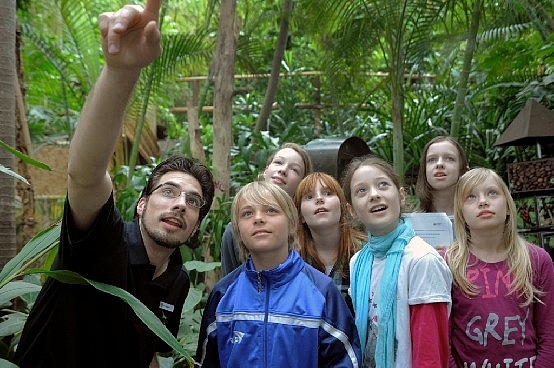 In the tropical hall in Potsdam, the participants of this tour are shown a part of this vast variety with explanations by experts from the Biosphere. Additionally you can grind spices, which can be taken home as a gift. Moreover every participant receives a little recipe to make their own chocolate candy. Guided Tour "Butterflies of the tropics"
Small, big, colorful, fluorescent, grey, yellow, camouflaged – you can easily lose your overview on the second species-rich insect with more than 180’000 different species: butterflies. In the 60 m² accessible butterfly-house of the biosphere, which has become home to uncountable butterflies from Asia and South-America, experts give the visitors an impressive insight into the world of butterflies. The gorgeous butterflies are great models, too! Guided Tour: "Biological Diversity in the Rain Forest"
The amount of species in the tropical rain forest is worldwide unique. Until today, no one knows how many different species actually populate the rain forest and how many of them die out every day. The sensitive system of the rain forest is kept in balance in the rhythm of daytime climate, evolutionary conditions and natural food chains. But the incredible amount of species is slowly, directly and indirectly decimated. With its over 20’000 plants and many animals the tour through the Biosphere projects an impressive picture of the rain forest and of its diversity of species, which should be protected and preserved. Guided Tour: "Medical Plants of the Tropics"
There are many myths and riddles about exotic plants. In our tour you get to know what healing power plants can have. Even decorative plants, you may have in your living room, might hold unexpected abilities. Moreover many of them are edible (without worrying). The flora of the jungle is used for many areas of application. Those areas of application can in part be very crazy – you will find out about that in our tour through the rain forest. Some flowers are capable of more than just looking pretty. Apart from the thematic guided tours and the Koi feeding, we also offer individual tours by appointment on the following subjects: flora and fauna, diversity of species or the present special exhibitions. Please make advance reservations under: info@.biosphaere-potsdam.de, Tel. Please note that the number of participants for any guided tour is limited to 15 persons, therefore please make advanced reservations on time, preferably by phone. Thank you!